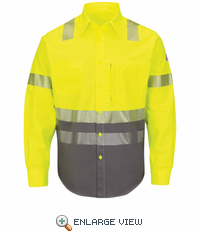 Fabric: › Fabric Westex Ultrasoft® Flame-resistant, 7 oz. (235 g/m²) 88% Cotton / 12% Nylon. 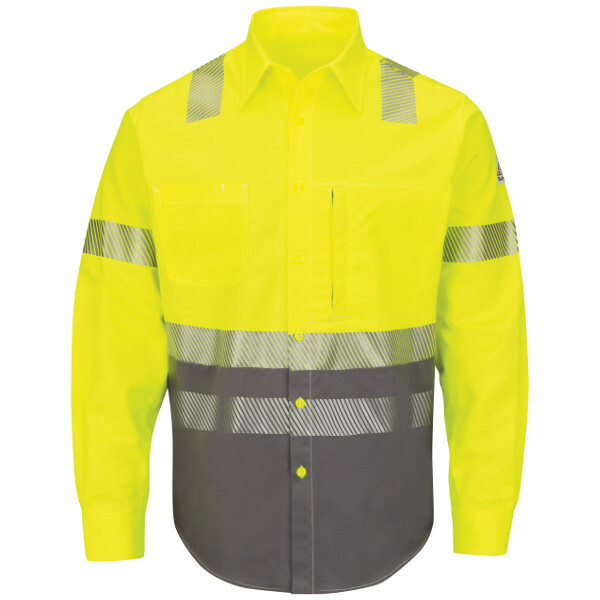 ANSI 107-2010 Class 3 Level 2 Compliant. Banded, topstitched collar › One chest pocket with button closure and pencil stall, one Napoleon chest pocket with zipper closure › Placket front with button closure › Topstitched cuff with button closure › Tailored sleeve placket › Color blocked shirt with hi vis upper half for ANSI compliance and grey lower half to conceal dirt and stains › 360° visibility with front and back 2" silver reflective striping › Full side seam gusset .